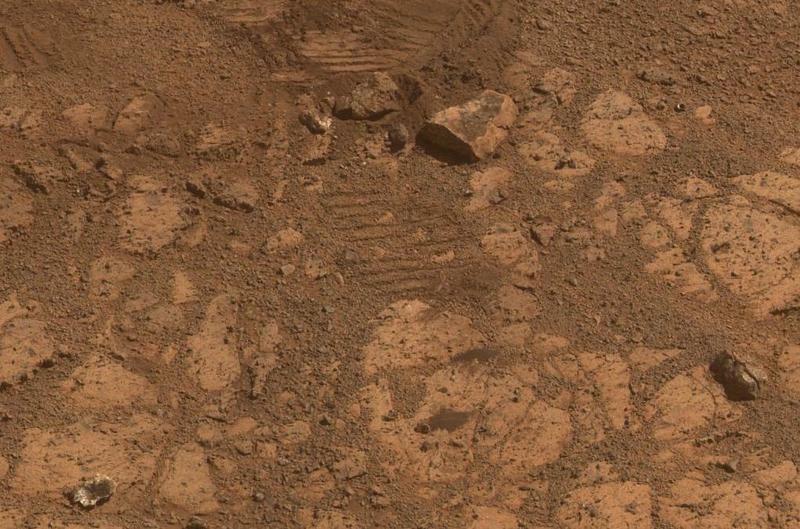 NASA's weird jelly doughnut rock mystery has been solved. Researchers on Friday said they've figured out where it came from, and it's not quite as exciting as some people hoped—nor is it an actual jelly doughnut, despite having an uncanny resemblance. According to Opportunity's Deputy Principal Investigator, Ray Arvidson, the piece of rock, dubbed Pinnacle Island, merely broke off from a larger rock that Opportunity drove over. The rock itself was only about 1.5 inches wide, and caused a stir after it mysteriously showed up during a series of images taken by NASA's rover. Arvidson said scientists were able to look back a short distance where Opportunity had driven, finding an overturned rock that had the same jelly doughnut appearance. Unfortunately it wasn't an alien or some other mysterious space creature. Complicated problems typically have very simple explanations. "We drove over it," Arvidson said. "We can see the track. That's where Pinnacle Island came from." But even though the rock mystery has been solved, its sudden appearance was actually a bit serendipitous. According to Arvidson, Pinnacle Island possesses high levels of manganese and sulfur, both water-soluble ingredients present inside the rock. Researchers have yet to determine if the concentration of elements, which were concentrated in the rock by the action of water, happened recently or a long time ago, deep below the Martian surface. Now that the jelly doughnut problem has been solved, Opportunity will continue on its journey to a boulder ridge known as McClure-Beverlin Escarpment, where the rover will examine other exposed rocks. NASA has provided an awesome image of the rock Opportunity smashed, showing us exactly where the rock came from.